To prep my skin, I've been using the Too Faced Hangover Primer. I'm still not entirely sure how I feel about this primer, I haven't noticed too much of a difference in how my makeup looks or whether it stays for longer but it's one I've decided just to keep using until I finish it. I probably won't repurchase it as it hasn't blown me away! 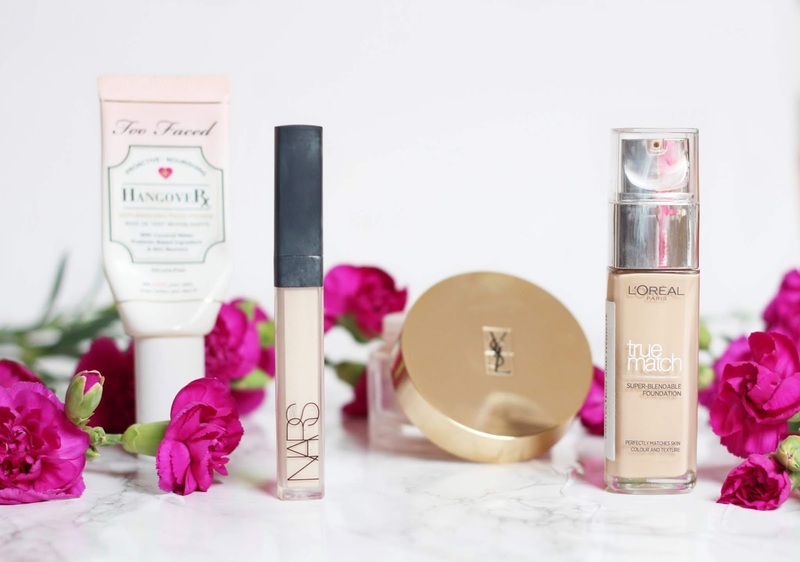 A recent foundation purchase was the L'oreal True Match Foundation, I had tried this years ago as a teenager but couldn't remember what I thought about it other than I think I had previously found it slightly drying. I recently asked someone what foundation they were wearing and they said this so I quickly went out and purchased it to give it a try. In short, I've been so impressed with this foundation. The shade match is great for me, the finish is lovely, it's not matte and not dewy but somewhere perfectly in between. I also love the coverage, it definitely offers medium to full coverage but it doesn't feel heavy in the slightest. I'm so used to really thick, full coverage foundations so this is such a nice change but I still get the perfect coverage that I want! As per, I use the Nars Radiant Creamy Concealer. I've used this concealer for years and will continue to use it for the foreseeable future, it's got really good coverage and blends really nicely into the skin. To set my makeup recently I've been using the YSL Souffle Powder, I really like this powder, it leaves a really nice finish on the skin without making it look too powdery or cakey. It is very expensive but I have had it for quite a few months and there's still loads of product left so I do think it's worth the money. I recently purchased the Anastasia Soft Glam Palette, I was obsessed with the Modern Renaissance palette so decided to give this one a go. If I'm being honest, I'm not in love with this one, I feel like it has a lot more fallout than the Modern Renaissance palette so it doesn't blend as smoothly. It is a decent palette but I would say if you're trying to decide between Modern Renaissance and Soft Glam, definitely go for Modern Renaissance! I had a bit of a break from liquid eyeliner but I am now back to using it daily, my favourite of all time is the Kat Von D Liquid Liner as the brush is really precise and it lasts such a long time. It's so easy for me to throw on in the morning in my tired state so it's a must have for me! 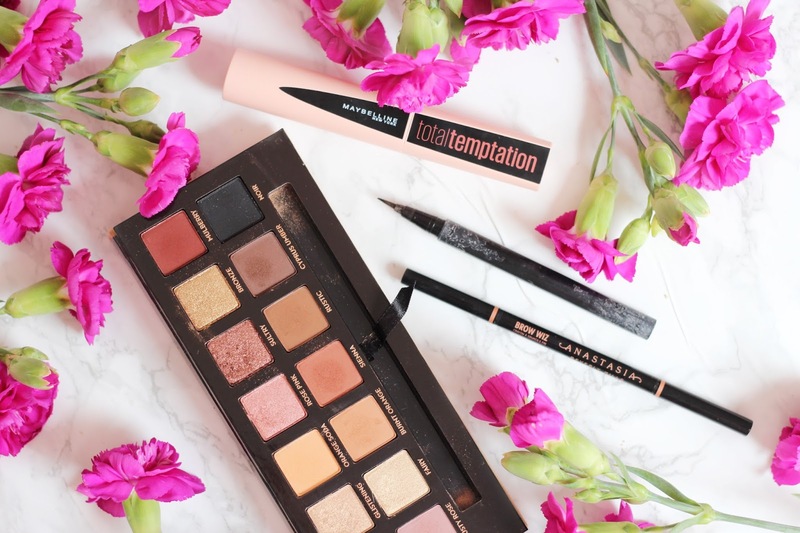 To complete my eyes, I add the Maybelline Total Temptation Mascara which is a new one for me. It's a lovely mascara and definitely adds volume to my lashes, I don't find it very lengthening but I don't need length to my lashes so it's one I've been enjoying a lot! I've been wearing different products on my brows recently but mainly I've gone back to the Anastasia Brow Wiz which I like to create a natural looking brow. I've used this product for years and really enjoy using it as it's quick, easy and always looks great. Which products have you been using on a daily basis?